Probably inspired by the TV series I Dream of Jeannie, which ran from 1965 to 1970, this is Barbie's genie outfit. 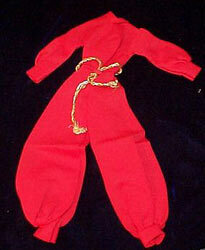 It is a one piece jumpsuit with harem style pants, with full legs gathered at the ankle cuff. There were variations in the color - some are more red, others more orange. The twisted gold and silver metallic tie belt is much harder to find than the jumpsuit. There were no shoes included in this ensemble. The jumpsuit is fairly easy to find.